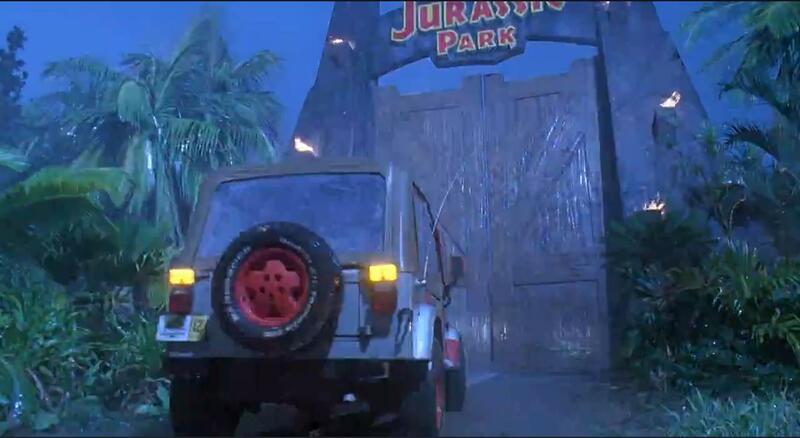 Beyond the electric tour vehicles, Jurassic Park operates a number of gas-powered jeeps. ...show jeeps with bright, strong amber tail lights, instead of the expected red. As shown in the picture below, the normal red running lights aren't even on - they should be on whenever the headlights are. A little poking around on the internet looking at pictures indicates they were mounted above the normal tail lights, so the expected lights are still present, but not nearly as bright as the ambers. like fleeing from the T-Rex. They appear to be built from fog lamp components, but fog lights are low and have a wide beam angled toward the ground, which reduces glare and helps see the road. Normal headlights reflect off the water droplets and back into the driver's eyes, impairing visibility instead of improving it. There is no functional reason for high-mounted, rear-facing fog lamps - they'd actually be detrimental, not beneficial. The question is what were the extra lights for? Why were they there? In-universe answers are favored over out-of-universe answers, but either way I'm looking for word-of-god type answers. Opinions and suppositions, no matter how logical, are not valid answers. The inclement weather often experienced on the island. The Jeeps weren't bound to tracks like other vehicles were. There is no functional reason for high-mounted, rear-facing fog lamps. Since these vehicles are driven off-road on an island with high growing vegetation, it would make sense to have lights mounted higher than lower; otherwise, their visibility could be obstructed by plants - an issue not present with conventional driving on a paved road. There has been speculation that Michael Crichton loosely based Isla Nublar on Isla del Coco or Cocos Island in the eastern Pacific. Cocos Island is a Costa Rican National Park 340 miles off the west coast of Costa Rica. Like Isla Nublar, which means "Clouded Island", Cocos Island receives especially high rainfall year-round and is the only island in the eastern Pacific that features cloud forests. From this, it would make sense to install additional safety lights on any vehicle that's not bound to a track, since there's constantly foggy weather. Left - off-road vehicle with additional safety lights; Right - on-track vehicle w.o. additional lighting. It could be argued that, if these lights were anything other than [automated] safety/weather lights, then, why would Dennis Nedry turn them on when trying to sneak out of JP? Jurassic Park Motor Pool classifies them as fog lights. If it barks, smells and looks like a dog, chances are, it's a dog. Did the Volcano on Isla Nublar exist in the first “Jurassic Park” movie?